I liked the room the breakfast and staff and specially the beach! The property is beautiful! Breakfast was very good and our room was lovely. It was just what we were hoping for. The area, close to the beach, clean, staff, the best breakfast I had in Brazil, equipment in the room if you wanna stay there for a while, pool, jacuzzi, green garden, cozy. Breakfast was really fantastic. Gardens are very pretty and well cared for. All personnel were very friendly and helpful. We were there without a car but were able to chose from a number of bar/restaurants within walking distance in the evening. The beach is wonderful and the estuary too. Possible to take surfing lessons or hire either a surf board or a paddle board at the beach. Our dog was able to walk with us without a leash through the sandy streets. Dogs are not allowed on the beach but you can sit at the beach bars with them. We came back to Sao Paulo totally relaxed and happy. We hope that we have an opportunity to return. Super comfortable bed, wide room, hot water in the shower, good breakfast, amazing garden with nice swimming pool, really friendly and lay-back owners who can accommodate all your requests. Short walk to the beach, which is a really nice beach! Itamambuca is a very nice beach, in a preservation area. The hotel is close to the beach, room was very confortable and the staff was very nice. A pousada é linda, logo na entrada nos deparamos com uma bela piscina entre a churrasqueira e espaço para o café da manhã. As suites nas laterais. Rodeadas por um jardim com um belo paisagismo. Ainda tem. O parquinho para as crianças. Tudo isso a poucos metros da praia. Diferencial é que eles pensam em tudo!! Oferecem cadeira de praia, barraca de sol, varal pra estender a roupa molhada de praia. Dentro das suites temos uma pequena cozinha com o necessário pra fazermos um lanche. Banheiro com todos os utensílios para retirar o excesso de areia do chão. Café da manhã bem variado, farto. Agrada a todos os gostos. Os anfitriões sempre atentos às nossas necessidades e super gentis. Eu voltarei!! Eu e minha familia adoramos o local , ótima recepção funcionários e propritários muito atenciosos , ótima limpeza , café da manhã muito bom , instalações modernas e aconchegantes , voltarei e recomendo. Buena cama, silencioso por la noche, desayuno muy rico, buena privacidad al final del jardín. Check-in super rápido y antes de la hora y la zona tiene mucho encanto. Lock in a great price for Suites Prime – rated 9.3 by recent guests! One of our top picks in Ubatuba.Just a 2-minute walk from Itamambuca Beach, Suites Prime offers modern accommodations with a garden. Featuring free private parking, the property is a 15-minute drive from the center of Ubatuba. The air-conditioned apartments include free Wi-Fi, a mini-bar, a microwave and a flat-screen TV with cable channels. The bathroom has a shower. 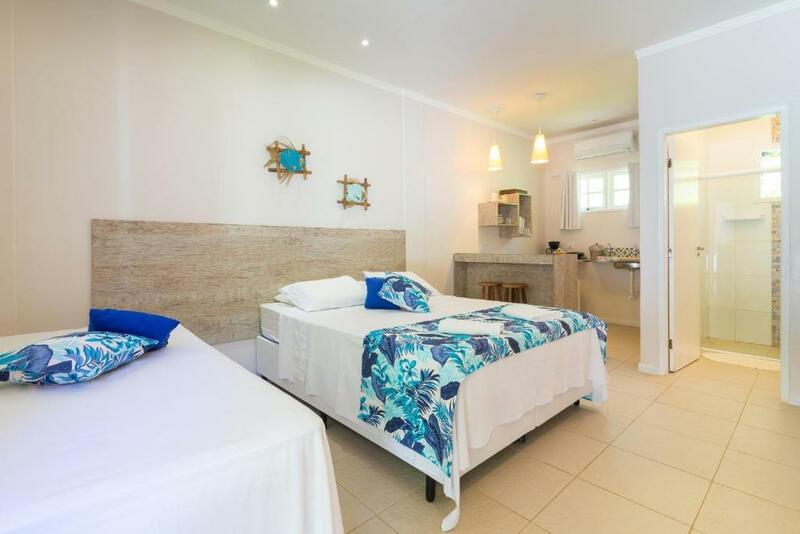 Suites Prime is a 1-hour drive from Caraguatatuba. Praia de Itamambuca is a great choice for travelers interested in tranquillity, beach walks and scenery. This property is also rated for the best value in Ubatuba! Guests are getting more for their money when compared to other properties in this city. When would you like to stay at Suites Prime? With a balcony and free Wi-Fi, this air-conditioned apartment includes a flat-screen TV with cable channels, a mini-bar and a microwave. This suite has a balcony, air conditioning, a flat-screen TV with cable channels and a mini-bar. Area Info – This neighborhood is a great choice for travelers interested in tranquillity, beach walks and scenery – Check location Excellent location – show map Guests loved walking around the neighborhood! House Rules Suites Prime takes special requests – add in the next step! Suites Prime accepts these cards and reserves the right to temporarily hold an amount prior to arrival. Just a little distance to Ubatuba if you gonna eat in a restaurant in the evening. You have to have a car. The AC makes some sound. The only negative points (and they are minor) would be that the individual rooms are not very well soundproofed and the shower room would benefit from a little storage space. If you are sensitive you should have earplugs with you! The pics were a little deceiving. The hotel is not ocean front. It's to blocks to the beach and you really need a car, because the location doesn't offer a lot of options for shopping. There's no pharmacy and the main town is far away. So, having a car is a must.